The initial pickup of Internet Explorer 10 was slow, as it was only available for Windows 8 users. Within the last few weeks Microsoft has released it for Windows 7 users as well, and while doing some other updates I decided to upgrade. Why not, I figured. For the few times I have to use IE I might as well have their latest offering. Is it just me or do they seem to be promoting old stuff as new features? “Search and navigate from a single place” – also the case in IE9 and before. “View or add favorites?” “Right click to show toolbars?” I could be mistaken, but I’m pretty sure there was a “Do Not Track” feature in IE9 also. That leaves pinning your favorites to your taskbar. This does seem like a cool feature, but when I clicked their link for “sites to pin” it began to look like there was a specific list of sites you could do this with. Despite this making it seem that you can only pin sites included in their listing, you can drag any site into the taskbar and pin it. 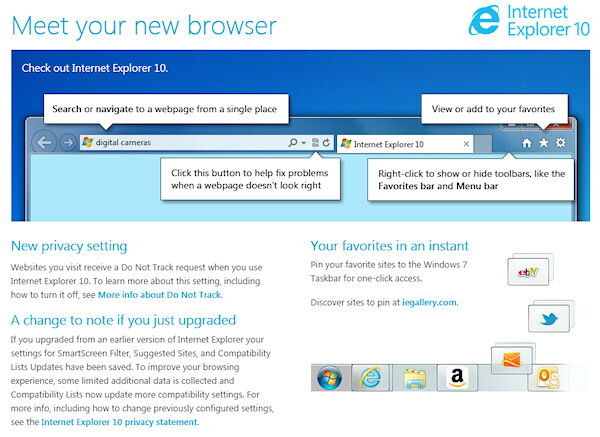 This is a welcome step forward for IE users, but this release rings a bit like the last few for the browser. That is to say there is a lot of fanfare for joining the party late, proudly announcing features everyone else has been making use of elsewhere for awhile. The 20% speed increase is nice, but does that make it faster than other major browsers or simply less slow than its own predecessors? (IE has consistently pulled last place in browser speed tests.) In my own playing around I did notice that IE10 was fast — really fast. I’m on the internet all day at work, as much of what I do is browser-driven. I may make IE10 the browser of choice for a day this coming week to gather some thoughts on it, as my typical day will run the gambit of different services and uses and really put the new browser through its paces. Is IE10 A Relevant Browser?